Jill’s first experience with people with disabilities was through a community service project in high school where she spent time in a DAC. From that moment that she knew she wanted to work in this field. 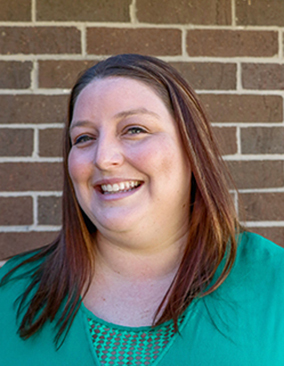 Jill started at Harry Meyering in 2004 as a Direct Support Professional and then became a coordinator in the Supportive Living Services program and now works as a Program Manager. The individuals and the excitement and personal pride that they get on a daily basis is what Jill enjoys most about her job. Jill attended the Community Social Services Program at South Central College. Jill loves to learn and grow personally and professionally and she enjoys sharing this knowledge and her experiences with other staff. Her focus on making a difference is evident in teaching and coaching; she loves to see growth in the individuals she supports, the staff and in herself. Jill has an interest in learning as much as she can about Alzheimer’s. She enjoys attending training on the topics and sharing the information and her experiences supporting people with Alzheimer’s with others. Jill’s passion on the subject even leads her to participate in the Alzheimer’s Annual Walk to raise awareness on the subject. Jill is married and together they have three dogs (Nala, Lily and Bella). She enjoys spending her free time with family and friends and playing volleyball. Jill’s hero is her mom. She has seen her mom overcome many obstacles and through it all she continues to be strong woman.